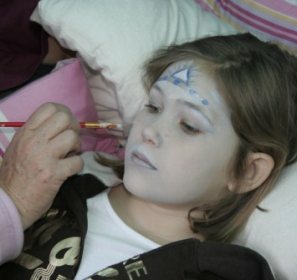 Learning how to face paint, can be a lot of fun, and need not be a stressful experience. Who can face paint ? People on an artistic journey that find the idea of painting a live canvas, a new artistic challenge and adventure. Starting out as a newbie is not as difficult as it used to be, since there is a wealth of information and useful tips, from a number of reliable sources on the Internet. But that is the problem, so much information, and tutorials and stuff all over the place. What I really like is that all of the books have the first 10 pages available as a free download, (so you can preview the content before deciding to buy). Also Lilly is respected in the face art world. "It was quick and easy to get the information I needed, and the content of the ebook covered all the questions I had"
Here is what Tina mailed me. Lilly's ebook is very good. I find that it feels like a friend is sitting down with me to talk to me about this business and giving me insight into tips and tricks that work. I really like it a lot and I like your site a lot too. With the current financial turmoil this book answers the question that lots of face painters are asking. How can I find inexpensive rainmaking ideas in dry times? 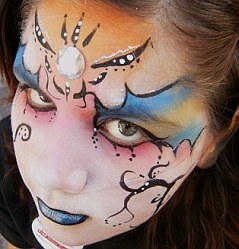 Marketing tips for Face Painters. Again I really like that the first 10 pages are available for free as a download. 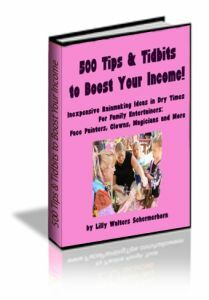 How to own a successful Face Painting Business! Step One: If you decide to start on this journey use the Contact Us Page and let me know your progress. Also join our FaceBook Page, to get daily inspiration from artists across the globe. 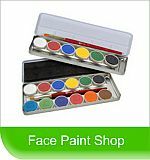 Practice your face painting daily, (if possible) at home with your own friends and family. Step Three: Put the word out in your community that you are available to face paint for parties and functions. Step Four: Get Listed as a Face Painter in your area. I host a Global Directory of face painters, so submit your contact details, plus 4 of YOUR pictures Submit for Free Note: Invest in good photos for your work. Take time to practice and submit only your best work once you feel confident. (Do not steal pictures off other artists, this will come back and bite you). This would be your worst possible start, since the artists around you may be your competition, (but it's best if they are also your friends). They have learned the business (the hard way) and you can learn much from more experienced artists. Step Six: Make sure you have your customer communications and Phone messaging/ Email / Capture form, well organized. Be sure your clients do not get frustrated, trying to contact you (so be professional). 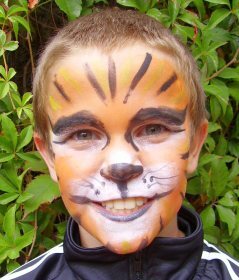 Anna Wilinski also offers some very honest and great advice in her Blog for those starting out face painting.